Over the last year, I have become a big fan of the PBS Newshour’s conversation with Brooks and Shields each Friday evening. What has drawn me to this segment each week is the calm, thoughtful manner in which these two men discuss the week’s major news stories. These conversations, as the award suggests, are civil and respectful. David Brooks is a columnist for the New York Times, and is generally identified as a moderate conservative. 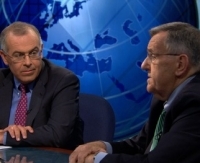 Mark Shields is a syndicated columnist and widely recognized for his liberal social and economic views. Yet, each week they come together in the studio of the Newshour and intelligently discuss the emerging issues of the day. It is refreshing to spend 10 – 15 minutes of my evening listening to two well-educated, thoughtful individuals share their perspectives about politics, global issues, and U. S. domestic and foreign policy. In their conversations, these two men are able to identify where they agree with one another, as well as disagree without raising their voices or calling the other demeaning names. This type of public civil discourse has been missing from the public square in the United States for decades. As the recent run of Republican debates have clearly demonstrated, even individuals supposedly on the same side cannot debate with one another in civility. The norm for public discourse has become who can shout the loudest and the longest. We have lost the ability to listen to one another, even those who supposedly agree with us, and remain focused on the issue under discussion. As Susan Cain points out in her book, Quiet: The Power of Introverts, we have become society that honors the cult of personality. Despite the rhetoric and no matter the topic whether it is religion, politics, economics, healthcare, alternative lifestyles, race, or family, too frequently the conversation deteriorates to over-simplifications that confuse the point, or steadily rising voices, or name calling designed to berate and deperson the other individual. As a society, or a community, or even as individuals, we have lost the ability to apply the basic existential principal of “being a part of or apart from.” The predominate approach to ‘dialog’ (a term I use very loosely here) is the use of power, strength, and overwhelming or defeating the other. We have not yet returned to the days of pistol duals to settle differences in opinions or perspectives, however today we use talk radio, billboards, social network sites, and myriad of other methods to smear an individual or destroy their reputation in order to prove we are “right”. As the Occupy Wall Street movement has demonstrated, peaceful protest and a call for civil public discussion of the issues and problems facing our country are nearly impossible to achieve. We would much rather invoke a fight or confrontation, we would rather engage in actions intended to cause physical pain and even death. We have lost our ability to sit down as responsible individuals and groups, to listen with intent and purpose, responding with thoughtful discourse that would enable the conversation to continue. There is a time and place for bloody revolution, and perhaps the day is coming when our nation will need to experience again the devastating battle of brother against sister, father against son, and friend versus friend. When a culture loses its ability to converse in a civil manner, it loses perspective and individuals or groups gravitate to those of like mindness further severing the connections that can bring about healing and understanding. Existentialism offers a very simple, but deep principle that enables conversation, which brings about growth, understanding, wisdom, insight, and hope. Existentialism tells us that we can be part of a family, while being apart from them concerning how we understand or approach a particular issue. We can be citizens of a country, while at the same time expressing differences with one another citizen without either of us being judged as unpatriotic or worse yet a terrorist. I can connect with my neighbor and participate in a meaningful friendship, while being a part from him in our political perspectives, or for which baseball team we root. I do not have to physically beat him, call him names, or vandalize his property because he does not think or see the world the way I do. Our society, our culture, our communities, our neighborhoods, indeed each of us could take the lead provided by Brooks and Shields and put into practice the art of civil discourse. As existentialists, there is no group of people better equipped to lead such a movement!